Awesome Maui Oceanfront! 5 nuits spécial week-end de la fête des mères ... $ 130 / nt !! Notre petit coin de paradis a été réaménagé pour vous offrir le confort d’une cuisine et d’une salle de bains rénovées avec un bel aspect ouvert. Nous avons également de nouveaux meubles, y compris un canapé-lit avec un matelas en mousse à mémoire de forme de 6 pouces qui est réellement confortable pour dormir! Notre condo est situé dans un bel emplacement en bord de mer / mer, à quelques pas des magasins, d’un marché de producteurs, d’un marché naturel, du meilleur café et de restaurants. En hiver et au début du printemps, vous pourrez voir les baleines dans le confort de la véranda, et les phoques et les tortues moine sont toujours un régal quand ils visitent l’année. À seulement 12 pas du bord de la plage semi-privée, vous pouvez flotter dans l’eau de mer, admirer les plaisirs de la plongée en apnée, du bodyboard ou tout simplement attraper des rayons de soleil. Lorsque nous avons découvert ce condo, nous avons été émerveillés par la vue ... et nous savons que vous le serez aussi! Ce condo comprend une chambre séparée avec un lit king-size et un canapé-lit dans le salon pouvant accueillir 2 personnes supplémentaires. Il y a des ventilateurs de plafond, mais avec les stores ouverts aux deux extrémités, les merveilleuses brises hawaïennes traversent pour le rendre très confortable à l'intérieur. Nous sommes à quelques minutes du golf de classe mondiale à Kapalua et Kaanapali, et la ville de Lahaina est à seulement 8 km. Ceci est le condo idéal pour les familles et les jeunes mariés. Nous savons que vous serez au paradis dans notre condo au paradis! Great location. Lanai leads RIGHT to the grass and the ocean is just 20 or 30 feet further. Nicely furnished and the bed was SOFT and COMFY, which is what my wife needs. Dealing with Matt (the owner) has been great too. Communicative but not buggy. Also helpful when we had some issues her in the island, as is the manager of the complex! Truly the best! We are so happy to have shared our Maui home with you! We welcome you to come back anytime to enjoy our truly relaxing and peaceful atmosphere! Mahalo and A hui hou! Great location, very clean, owners are easy to work with! Thank you so much for staying in our Maui home! We love sharing the great views it has to offer along with being so close to everything! The Miller's condo was a good choice for us this time in Maui. Location was perfect and I loved staying on the ground floor where you could look right out on the ocean and hear the waves breaking on the sea wall. The condo was a perfect size for the 2 of us (65+ years young!) and very well stocked. We even received a letter from the Millers describing the condo and their favorite restaurants nearby! We have stayed in the Westin Ocean Resort Villas in a friend's timeshare, and if a big, 5 star resort is what you are looking for, this is not it. But if you are looking for a comfortable, affordable, well-run and well-cared for condo, look no further. There are a couple of cons, however. We're from the south, and whenever it gets up to 75 degrees the air conditioning goes on; we are spoiled. When we arrived it was raining hard and the way the condo is laid out, there is a strong cross breeze from the living room/lanai oceanside through to the bedroom near the parking and lobby area. So the cross breeze brought in the warm air and 100% humidity so it felt sticky and damp. But sleep was fine that night and the next morning (and the rest of the stay) the temperature and humidity was not a problem with the cross breeze cooling the condo down. The other slight issue is that the bedroom is near the parking and lobby area and it was a little disconcerting to hear people as they were returning in the evening when we were in bed. But there is a quiet time lined out from 10 pm to 8 am and noise was not a factor. And we saw turtles every day swimming right in front of the condo. Thanks for an enjoyable stay! Thank you so much for staying in our Maui home! Being so close to the water gives not only the beauty of the views but the gift of seeing those awesome turtles coming through regularly.... and, unfortunately, those few times during storms when the breezes work against us. 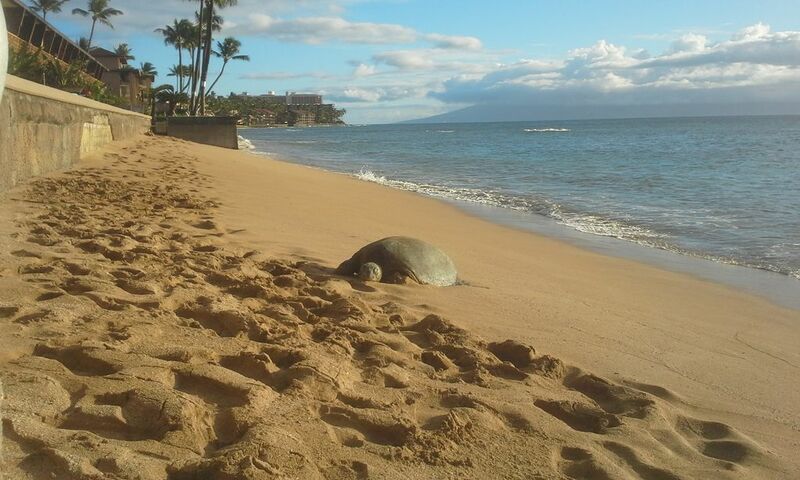 We are so glad you had a wonderful time and if you return to Maui we'd love to host you again! Had a great time and recommend it. We were happy to host you in our Maui home! We are glad you had an enjoyable time! We have loved staying here in Makani Sands #108 for the last week. The incredible views are the first thing we noticed coming into the condo. Stunning! We've enjoyed being able to walk right out of the condo, across the grassy area, and right into our beach lounge chairs. The beach in front of Makani Sands is perfect. We loved walking out into the gorgeous turquoise and blue waters! Without a doubt, the most favorite part of our stay was watching the almost constant parade of sea turtles swimming in front of us. Amazing! In the condo itself, having a kitchen and washer and dryer have been great. The condo complex is older but we were looking for low key relaxation, and that's just what we got. The only improvement would be A/C in the bedroom for sleeping. We did use the box fan to cool it off a little more. Mahalo, Matt and Family, for sharing your special home with us. We hope to return soon! We are so happy to have shared our home in paradise with you! We love the beach and turtles so much as well. Unfortunately due to building regulations we aren't able to have A/C in the bedroom, but between the ceiling fan and box fan we're glad that it cools it down enough to be comfortable at night. We would love to host you again in the future!!! Yes it is really 20 steps to the water!! This is a quaint complex, and the people there are wonderful. From the check in with Marie and the maintenance crew!. Very beautiful sunsets from the Lanai. It is that quaint, "Hawaiian home" feel of our complex that added to the spectacular waterfront/beachfront beauty of our property that made us fall in love with it! We are so glad to have shared it with you and hope to share it with you again should you return to beautiful Maui! Mahalo!! Nous sommes situés sur une plage semi-privée située à proximité d'un marché de producteurs, d'un marché de produits naturels, d'un café, de restaurants et d'un magasin de plongée. À 10 minutes en voiture de la ville historique de Lahaina, vous pourrez faire du shopping, dîner et participer à des excursions en mer (observation des baleines / des dauphins), du ferry-boat Lanai et de bateaux de pêche. Le golf de classe mondiale est à 5 minutes dans les deux sens. La belle plage de Napili est à seulement 5 minutes au nord et 10 minutes plus tard, elle est une véritable catastrophe naturelle aux proportions épiques. L'aéroport est à 40 minutes en voiture à Kahului. Deposit is refundable if cancellation is requested prior to 60 days of arrival date. Once full balance is paid, there are no refunds. There will be a $50 fee on all cancelled reservations.